our eCommerce store is your customer's gateway to your products. It's here they will decide whether or not to purchase your products and contact you for further information. The information you have within your store also helps them decide if you are trustworthy, if you have the right solutions to solve their problems and how much of an expert you are within your industry. There are many different ways you can present information to those potential customers to increase your online sales. This July, we're focusing our newsletter on ways you can increase the sales through your eCommerce site, plus sharing with you some of the new features we've put into place to help you out. You can now view visitor traffic live. See who is looking at your website right this minute, and even see the names of known visitors. See what websites or search engines they used to find you, and where in the world they come from. Learn how they navigate your website, and what search keywords they are using to find products or information on your website. This is a great insight into what you could be selling. Because this data is cross referenced with our database, we can provide you with more detail than is possible via Awstats or Google Analytics. You can access these new reports via the SEO tab or via the "recent visitors" link on the CMS welcome page. rural delivery checking - the rural delivery checking feature helps confirm if a delivery address is rural or urban. This increases the chances that the correct shipping method is selected by the customer, reducing the likelihood that the cost of shipping has been underpaid.We implemented rural code logic using New Zealand Post's data, helping to identify if the address entered by the customer was rural or urban. filtering shipping options by categories - when an item is purchased from an individual category, it will automatically select the shipping cost associated with that category. filtering shipping options by weight - after you have preset your shipping cost options and the product weight, the customer will be presented with the shipping cost best associated with their product order. Loyalty points program - a great way of encouraging repeat business, a loyalty points program gives customers a set number of points depending on the type of purchase they make from your site. You decide how many $ the customer must spend to receive a loyalty point and once fully set up, this will run without you needing to do anything. Click here for more details on setting up a loyalty or rewards program. Discount or promotion codes - rather than having a blanket sale throughout your site, offer discount or promotion codes instead. You are able to tailor and offer these codes to a specific audience, using your knowledge of them to make it an irresistible offer. Once logged in to the CMS, head to your Shopping page and select Discounts / Promo Codes to set these up. Courier Integration - We understand time is important, and your margins are tight. To ensure you make a profit, you need to fulfill your orders in the most efficient manor possible. Using an integrated courier will streamline the task of printing your courier dockets and avoiding mistakes. Some courier integrations can even post the parcel tracking notification back to the customer. Each product can be individually promoted into the template, home page, or checkout. Take care not to over do it, as if you promote too many items, you may just annoy your potential customers with clutter. However, promoting a very few items can be very beneficial. You can also promote items to the checkout page. This is a great time to ask if they "want fries with that?". In addition, you can specifically link related products, so that they are auto suggested on the product page or at checkout. We can automatically promote products based on other customers historical purchasing patterns To enable automatic suggestions, please go to the shopping setup area, select Customise Display Options, scroll down to the area Checkout and Notification Options and tick the box Suggest Products on Checkout. It is much easier to sell to an existing customer than to convert a new customer. It's also much cheaper, with less advertising necessary to make a sale. Sending a monthly newsletter is a great way to keep your business in the mind's eye of your customers. You can segment your audience and newsletters and target special deals to customers who previously bought a specific item. You could run a VIP program, when customers who subscribe to your mailing list are able to access an immediate discount. Customers just need to register, then click the link in an email, to gain access to your members area and special VIP pricing. If you sell gifts, or items which need regular maintenance or replacing, you can add a "Anniversary Reminder Service" in the shopping setup area, under Checkout Options. This sends customers an email letting them know when it's time to make another purchase. For more great tips on how to increase sales on your website, check out our article Easy Ways to Increase Sales Through An Online Store. An open cart is the status of a cart prior to checking out. In our system, you are able to view open carts, and if you have encouraged your customers to login, then you will also see which customers have open carts. You can only judge if the cart is abandoned based on how much time has elapsed. An unpaid order is the status of a cart, that was submitted, ready for payment, but payment did not complete. Sometimes people don't have enough credit on their card, or they lost their card, or the phone rings. You can enable reminders to be sent to these customers after a period of time you choose. You can also personalize the message. Unleashed, Vend, Xero API's have all been updated. It is now easier to integrate with these third party services, and debug any issues in real time. Auckland web designer Andrew from Fury, has redesigned a site which had recently been migrated from WordPress to Website World. During the migration, all of the content and images, plus kept the valuable URLs or filenames stayed the same, so no link juice was lost. 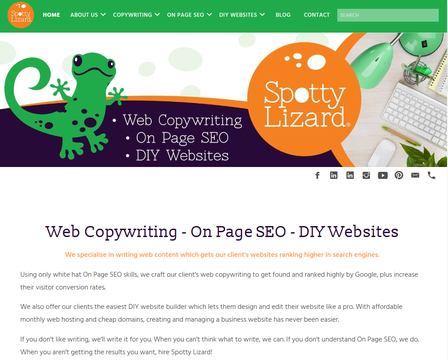 We invite you to take a look through Spotty Lizard's website and see the great web design work Andrew has done. Looking for a timeless, classic and clean template? You can't beat this! 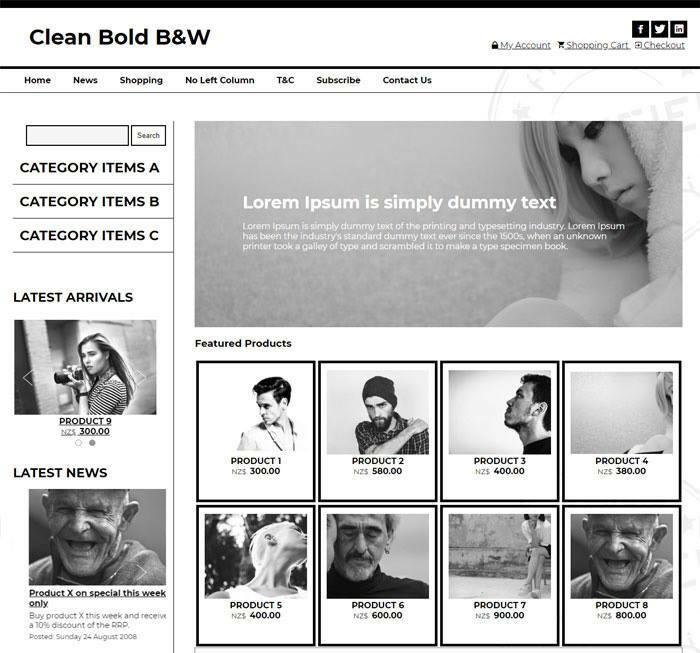 Ideal as an eCommerce store, you can add colour images and graphics should you wish. Or simply keep it black and white only.